Braun and Humbert are monitoring the ice sheet daily via Envisat acquisitions as part of their contribution to the International Polar Year (IPY) 2007-2008, a large worldwide science programme focused on the Arctic and Antarctic. The ASAR images used to compile these animations were acquired as part of ESA's support to IPY. ESA is helping scientists during IPY to collect an increasing amount of satellite information, particularly to understand recent and current distributions and variations in snow and ice and changes in the global ice sheets. ESA is also co-leading a large IPY project – the Global Interagency IPY Polar Snapshot Year (GIIPSY) – with the Byrd Polar Research Centre. The goal of GIIPSY is to make the most efficient use of Earth-observing satellites to capture essential snapshots that will serve as benchmarks for gauging past and future changes in the environment of the polar regions. ASAR is extremely useful for tracking changes in ice sheets because it is able to see through clouds and darkness – conditions often found in polar regions. Long-term satellite monitoring over Antarctica is important because it provides authoritative evidence of trends and allows scientists to make predictions. Ice shelves on the Antarctic Peninsula are important indicators for on-going climate change because they are sandwiched by extraordinarily raising surface air temperatures and a warming ocean. The Antarctic Peninsula has experienced extraordinary warming in the past 50 years of 2.5°C, Braun and Humbert explained. 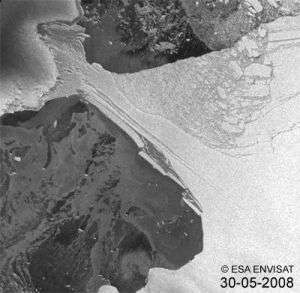 In the past 20 years, seven ice shelves along the peninsula have retreated or disintegrated, including the most spectacular break-up of the Larsen B Ice Shelf in 2002, which Envisat captured within days of its launch.